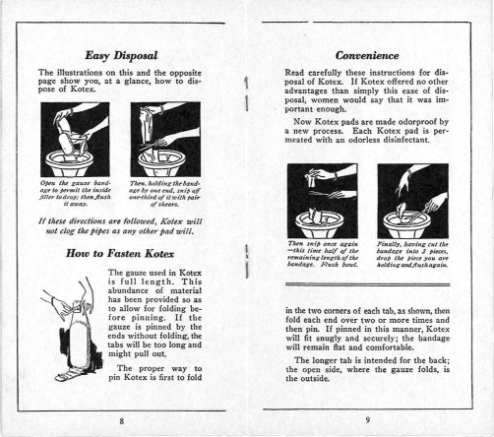 Physiology and Hygiene of Menstruation, Kotex Company, 1928. In this free booklet, the company demonstrates how to wear its pads and how to discard them in the toilet – by cutting them into pieces and flushing twice!. Kotex suggested that the new pads, when disposed of properly, would not clog the pipes, a discreet alternative to leaving them in the trash. Flushing pads appealed to women’s desires for convenience and secrecy but continued to have a bad effect on plumbing, despite Kotex claims.